The walking school bus helps parents who are not able to see their kids off to school in the morning. 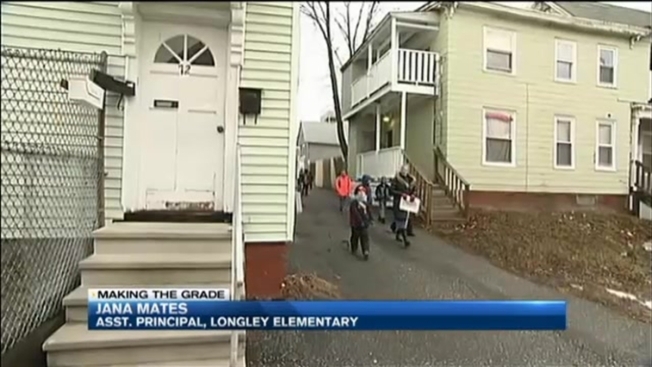 Teachers in Lewiston, Maine are going the extra mile to reduce chronic absenteeism at an elementary school. Every morning, a dedicated team of teachers walks about 1.5 miles around the neighborhood surrounding the Longley Elementary School, going door-to-door, picking up students and making sure they make it to class on time. It's called the Walking School Bus. "Last year we targeted specific students, and their attendance rates completely turned around," said Assistant Principal Jana Mates. The students who take part say it's something to look forward to every morning. "Some kids, they wouldn't walk to school," said fifth grader Justin Harris. "They would go somewhere else." Lewiston Superintendent Bill Webster said addressing chronic absenteeism is the first step in closing the achievement gap in his district. "School isn't a high priority in this area," said teacher Kathryn Mathon, who walks the route every morning. "Some kids are worried about where their next meal is coming from, so they're not worried about coming to school and reading a book." Mathon said the Walking School Bus helps parents who aren't able to see their kids off to school in the morning. "Sometimes, we might be the first people [the students] see in the morning," she said. There are between 10-15 students who take part in the walking school bus, and administrators say the idea has become so popular, there's a waiting list to get more students involved.